Thank you, Jane, and our thanks to you and your family for your long-time support of baseball's most cherished and valuable institution, the National Baseball Hall of Fame and Museum. Thank you, Bud. Commissioners face many challenges but we admire the job you are doing, and keep up the good work. And thank you, President Jeff Idelson. The Hall of Fame is in good hands with your leadership. Our family has thought a lot about what my dad's reaction would be today, and I think the first thing he would do would be to thank the Dodger Hall of Famers who played for him and have passed away: Manager Walter Alston, Roy Campanella, Don Drysdale, the Captain, Pee Wee Reese, and Jackie Robinson. Next, he would have expressed his appreciation to the Dodger Hall of Famers who played a majority of their careers with him and are here today: Manager Tommy Lasorda, Don Sutton and Sandy Koufax. Duke Snider was unable to make the trip, but we send Duke and his wife Bev our very, very best wishes. My dad had great respect for the umpires, and he would tip his cap for a job well done to two friends and Hall of Fame umpires Al Barlick and Jocko Conlan. He would also like to recognize and thank two winners of the Ford C. Frick award, Jaime Jarrin, who my dad hired 50 years ago and is still broadcasting Dodger games in Spanish and is here today. And, Vin Scully, who is in his 59th season broadcasting Dodger baseball. Vin is working at Dodger Stadium this afternoon. Now, to all the great Hall of Famers assembled here today, our profound gratitude for your extraordinary accomplishments. Dad was fortunate to know many of you and he would have enjoyed visiting with you this weekend and thanking your personally. I would add that all of us appreciate your commitment to the Hall of Fame and taking the time each summer to return for the induction ceremony. My dad would have been a proud member of the Class of 2008. He would congratulate his classmates and organize a great party for everyone this evening. He knew how to put together a fun party; his favorite was our annual St. Patrick's Day party each spring at Dodgertown, Vero Beach, Florida. Of all his classmates, he knew Commissioner Bowie Kuhn best. Baseball had tough issues in those days also, and he worked with Bowie, the League presidents, and the other owners to help identify solutions. He admired Bowie greatly and often said how much he respected Bowie's position that nothing was more important than the integrity of the game. Luisa, I'm particularly happy to be here today with you and your family. Speaking of family, we may have the largest cheering section here. In addition to my wife Annette and our two sons, my sister Terry Seidler and her 10 children and 21 grandchildren are here also. My Dad had a dream, a goal: He wanted to design, build and privately finance and maintain the best baseball stadium. He began working on that in 1946 to replace the aging Ebbets Field. After 10 years of trying, an unprecedented effort, he concluded that it could not happen in Brooklyn. Then and only then did he look elsewhere. 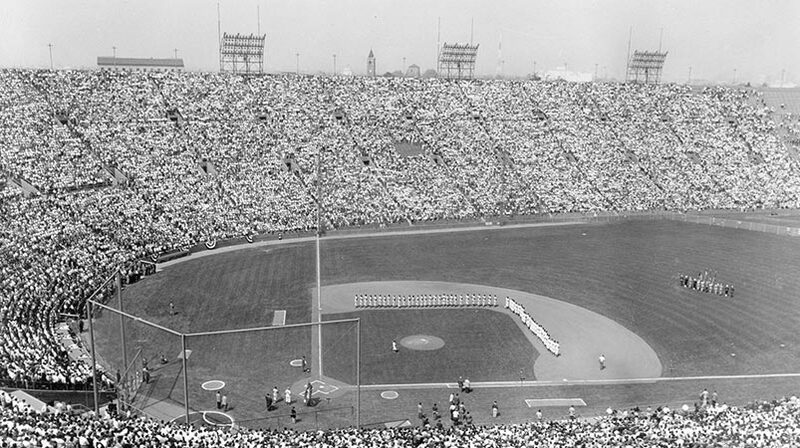 It was a difficult decision for our family, but when Dodger Stadium opened in 1962 in Los Angeles, I believe that was the fulfillment of his dream and his happiest moment. He appreciated the fans' acceptance of Dodger Stadium, and he and my mother, always by his side, enjoyed all the Dodger home games. He truly cared about baseball and its future, enjoying and supporting Little League baseball, amateur baseball and international baseball. Today he would have considered his induction to be a tribute to all the men and women who worked so diligently and loyally for so many years. All his memories were good. And our family is most grateful to be here with you at the Baseball Hall of Fame, a national treasure. Thank you.